In wildlife photography, it's so easy to get caught up looking for just the biggest, flashiest male to photograph. Unfortunately, this often means that the females don't get the attention they deserve, unless they have babies in tow. That's a shame though, since females of many species are just as lovely as their male counterparts. While male California quail are definitely showier, the females are quite beautiful, and share many of the same plumage patterns. Unfortunately, the females tend to be much more secretive, and I have rarely seen them out in the open for extended periods of time. 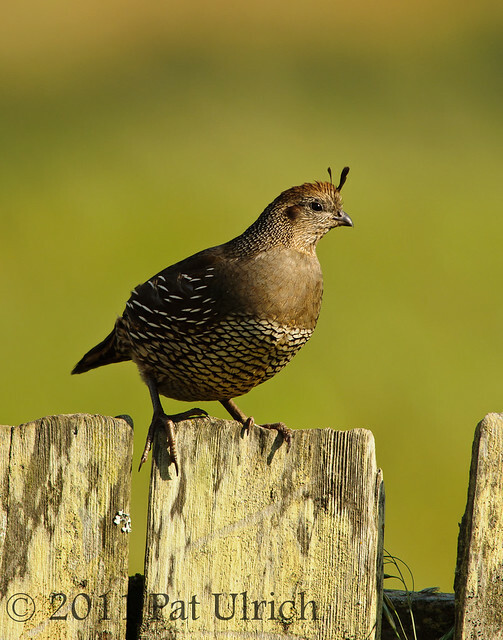 This female, however, hopped up on a fence post and stood there for a minute or two in late afternoon light before returning to her more secretive ways in the tall grass at Pierce Point Ranch in Point Reyes National Seashore. I was quite happy to have this fleeting chance to take some photographs of a female quail out in the open. 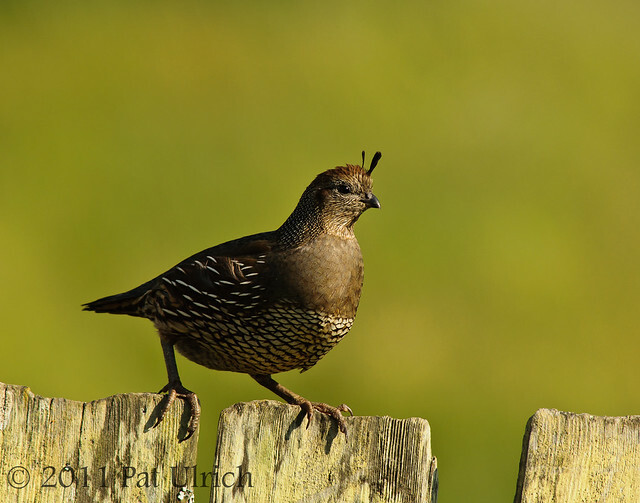 You can view more images of quail in my Quail Gallery. Submitted to World Bird Wednesday -- follow the link to see this weeks bird-related posts! They are splendid, Pat. Boom & Gary of tyhe Vermilon River, Canada. She's a real beauty Pat. Interesting thoughts Pat. The Ladies often do not get their due when it comes to prioritizing shots. Must be human nature acting up again. I know I am spoiled by seeing some of the best of your photography but it seems like you never miss. You have done a great justice for all female quail everywhere! Fantastic shots of the Quail. The lighting is just perfect. Well done! Beautiful image. Gotta love the blown out background and that perfect light. Would you say you were pretty close? I figure with the combo of a long lens and closer proximity. I couldn't agree more about the females getting less attention. I often love the character in female grackles when the shiny dark male gets all the attention. She's lovely! Your photographs showcase her beautiful plumage. Beautiful bird and great great photos. In the last photo she looks as if she's not staying around for long. I went back and compared her to the male in your post a couple back-- and I think she is every bit as lovely in her own way (course maybe I'm prejudiced ;>). Lovely how she posed for you. Beautiful, colourful birds and so beautifully photographed as well. I agree, sometimes we spend too much time on the males and not enough on the females. Great pictures. SO gorgeous...Love the lighting and detail of the feathers..an excellent capture. More beautiful shots of this bird Pat. I like the top one best. Awesome captures as always Pat! She is a beauty and you did her justice by presenting her to us in such a revealing and complementary manner. Thanks. I am all for the ladies. Great captures and more than great point!!! Thanks, Holdingmoments! I always enjoy walking around this area in the late afternoon for that light! Thanks, Springman! It's easy to do, just because in many species the males are much more colorful or patterned, and often larger, and there's something about getting that "trophy" shot. And thanks for your kind words -- I certainly miss a lot, although the more I get out to shoot the higher my success rate gets. But as you noted, I only share my best stuff on my blog/website. Thanks, Jarred! I was pretty close to the quail. Part of the "secret" of my bird photography is getting close to the birds to accentuate the dof. Especially because I have to shoot at f/8 to get the best sharpness out of my lens. Thanks, Esther, Andrew, and Pat! Thanks, Mick! She gave me only a minute or two on the fence before dropping back to the ground. Thanks, Sallie! I agree that she is lovely. I wish I had more shots of the females in my library, but as I mentioned, they are much more sercretive and don't like being out in the open too much. Thanks, Domonic -- I agree! Thanks, Bill! I think we all do it at times, but I do make an effort to photograph females whenever I get the chance, even if they aren't as flashy. Thanks for the very kind words, MaineBirder & Larry! Nice images Pat. You're right. Female birds are often neglected by us photographers. Lovely images, Pat. Love the golden shimmering lights in the bird and the fence posts!